In under a year, Prime Now has grown from one location to more than 20 metropolitan areas across the U.S.
SEATTLE--(BUSINESS WIRE)--Dec. 10, 2015-- Amazon.com (NASDAQ: AMZN) today announced that it has added more than 4,000 items to its Prime Now service just in time for the holidays. Whether it’s a big-screen television, top toys and gift-giving items or supplies for yuletide baking, Prime Now has everything customers need to skip a trip to the store this holiday season. Delivery from local stores is offered through Prime Now in Chicago, Los Angeles, Manhattan, Portland and San Diego. The most popular items ordered by customers for one-hour delivery from grocery stores include organic bananas, avocados, tomatoes and organic apples. Starting today, Eataly is being added to the lineup of local stores offered in Manhattan and Prime Now Chicago is adding local store delivery from Plum Market, Sprinkles Cupcakes and My Fit Foods. 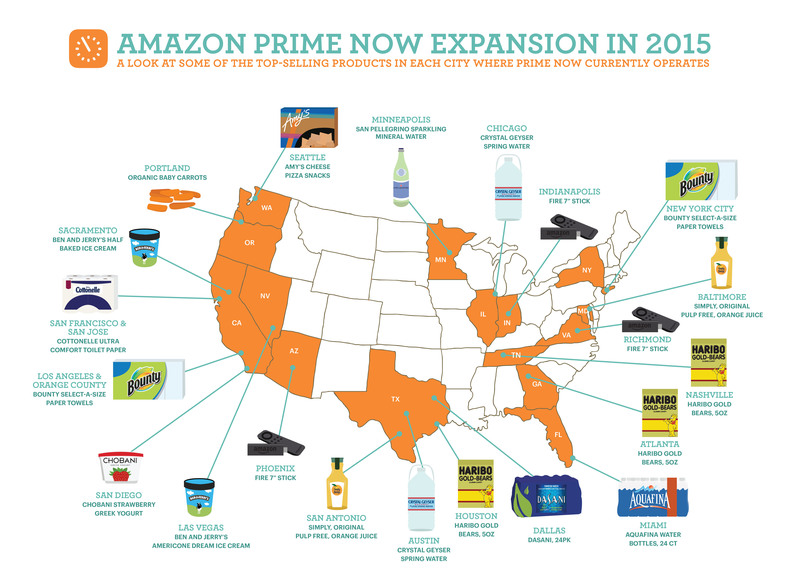 You can see some of the top-selling items by city through Prime Now in the accompanying infographic. 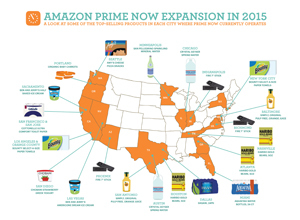 To learn more about Prime Now, visit www.amazon.com/primenow.